George David's American Maxi Rambler 88 scorched around the 600-mile track to set a new monohull course record of 37 hours 41 minutes and 45 seconds, beating the record set by David's previous boat, Rambler 100 in 2011. 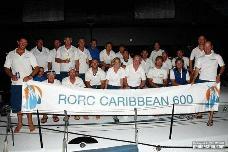 After setting the best corrected time under IRC, Rambler 88 remained unbeaten, winning the RORC Caribbean 600 Trophy. George David commented. "In 10 years the '600 has gone from a handful of boats in its first edition, to 84 on its tenth anniversary. It's a great race all around; congratulations to the RORC and everyone involved. We're delighted to have won overall in IRC and better yet to have broken our own record at the same time." Audio interviews with some of the skippers and crews in the RORC Caribbean 600, interviewed by Race Reporter, Louay Habib can be found here. List of 2018 class and special prize winners here.